The Weapon/Anti-Vehicle Model 6 Grindell/Galilean Nonlinear Rifle (W/AV M6 G/GNR), colloquially known as the Spartan Laser, is a man-portable and vehicle-mounted solid-state directed-energy anti-vehicle weapon used by the United Nations Space Command. It is one of the few directed energy weapons fielded by UNSC forces, aside from the pulse lasers used by Office of Naval Intelligence prowlers and the X23 NNEMP Cannon used by Gremlin Combat Support Vehicles. The Spartan Laser's blueprint from Halo Reach. The M6 G/GNR was originally created in concert with the GUNGNIR Mjolnir armor variant as part of Project GUNGNIR, a program designed to provide supplementary matériel for the SPARTAN-II program, hence the "Spartan Laser" moniker. The M6 G/GNR is a man-portable, shoulder-fired, directed energy weapon used by the UNSC. When the trigger is pulled, a red targeting laser is painted on-target accompanied by an audible whine as the weapon cycles up. The Spartan Laser will then charge for approximately three seconds before discharging the main laser. As the Spartan Laser charges, the charging tone gets noticeably louder and increases in pitch up until the laser is fired. The firing sequence can be aborted without discharging the battery as long as the weapon is not actually fired; for example, if the target moves out of sight or the operator needs to displace. The laser is a powerful microsecond-long pulse of energy capable of burning through thick plates of metallic laminates, nanocomposites, or hardened steel. The casing holds a high-capacity battery cell that feeds into a pulsed-power array and crystal slabs that produce the weapon’s devastating beam. Heat management forces significant downtime between shots, and so the weapon enters an approximately two-second-long standby sequence between shots. The Spartan Laser has a small blast radius, injuring targets within two meters of the point of impact and toppling light vehicles. The Spartan Laser is the most expensive small arm known to be produced by the UNSC. It costs 218,000.00 cR, more than the cost of four fully armed M12 Warthogs, 134 MA5B assault rifles, or over 7,266 M9 fragmentation grenades. Although the Spartan Laser was considered to be "ruinously expensive" at the time of its introduction, later refinements led to a reduction in production cost which is now only considered to be "extraordinarily expensive". During the Human-Covenant War, only Orbital Drop Shock Troopers and Spartans were given ready access to the weapon. The AV-22 Sparrowhawk is equipped with a nose-mounted M6 G/GNR in addition to its twin-linked autocannons. This version of the Spartan Laser has similar firing and recharge rates to the man-portable version, though it has higher damage potential and a faster charge up. Unlike the standard Spartan Laser, however, the version mounted on the AV-22 fires a bluish-white beam, which may suggest higher intensity; this is likely, as the Sparrowhawk can certainly carry a more powerful battery than the BA-53635/PLMD used by the standard version. Some of the components that were on the Sparrowhawk' Spartan Laser were later miniaturized and installed on infantry-portable M6/E variants after the Covenant War. The E ("Enhanced") model M6 high-energy laser is just as capable as earlier examples, but is an order of magnitude cheaper to manufacture. Primarily used as an anti-tank laser, the M6/E fires a devastating energy pulse after a short warmup time. Endgame: Endgame is an improved model of the M6/E variant with a doubled battery capacity and reduced charge time. It has the downside of having less strength than its normal counterpart. Selene's Lance: This advanced variant of the M6E model, built using new components from the labs in Seongnam, has a faster charge time and a longer beam duration, with 50% additional battery capacity compared to its normal counterpart. The targeting laser is also harmful. In War Games simulations, balancing adds extra recoil and removes the beam's ability to pierce through multiple targets. It is also equipped with a Forerunner anti-materiél effect that can disintegrate enemies upon death or dead bodies in the same manner as the Scattershot and Incineration Cannon. A G79H-TC Pelican using its M8C G/GNC. The M8C Grindell/Galilean Nonlinear Cannon is a nose-mounted variant that is equipped on the G79H-TC Pelican gunship. It functions similarly to its infantry-carried counterpart, but on a much larger scale. Due to the increase in size, its damage output is increased as well, allowing it to obliterate large vehicles such a Phantom with only a few direct hits. The M8C also has an effectively unlimited supply of ammunition as it draws power from the gunship it is mounted on rather than a battery. When the weapon is equipped, a shroud over the emitting lens of the laser lifts up to expose it, presumably to protect it from scratches and battle damage when holstered, although the weapon is shown with the shroud up when it is on a person's back. This was probably an overlooked graphics flaw in the games, though. The shroud can be seen releasing from its protective state when the weapon is drawn in first person view. A small hydraulic or pneumatic cylinder on the left side of the shroud actuates the shroud where it is anchored to the chassis of the weapon. When the trigger is pulled, a harmless red laser sight is projected on the target and a unique targeting tone is emitted which slowly becomes louder. The Spartan Laser will then charge for four seconds before firing a red laser beam that usually destroys the target. In the Halo 3 beta, if the reticule was moved while firing, a scattering of beams would be released, spreading over the targeted area. For the few frames while the laser is fired, the right targeting stick is disabled. The beam can be strafed, however, over a larger area if the player is moving while the laser is firing. The Spartan Laser is equipped with a smart-linked Wyrd III optics suite for increased accuracy and is capable of 3× magnification. Its reticule, whether on 1× or 3× magnifications, features a meter on the right side showing the charging status of the laser. The tick mark rests at the bottom of the circular shaped reticule while the laser is dormant, and gradually travels along the reticule's circumference until it reaches the point of origin, indicating that the laser is currently discharging. The Laser beam is devastating to infantry at any range. Contrary to popular belief, the Spartan Laser is not a one-hit, one-kill weapon. In gameplay, damage is inflicted on a target by means of multiple, precision strikes from the laser. Instead of what appears to be one intense, uninterrupted beam of energy, the laser is actually multiple, but smaller, charges of energy, sent downrange in rapid succession, giving the appearance of a continuous beam. As the laser is light, there is little chance for escape or evasion before imminent doom. However, it is possible to avoid complete annihilation by traveling at high speeds or quickly finding some cover, thus avoiding the rest of the devastating beam, which allows for targets to be "clipped" but survive. Once the main laser is discharged downrange, the target receives the intense increase in energy as thermal energy, which then proceeds to impart physical changes upon the target. With each passing millisecond the target is hit by the main laser, the energy levels rise until they become intolerable and result in combustion, in the case of vehicles, or death. Under normal circumstances, as long as a direct impact is delivered, one laser shot will destroy any target. Tanks cannot simply be fired upon at any location; each has a vulnerable point that must be hit in order to achieve a catastrophic kill with one shot. The Wraith must be fired upon from the vehicle's rear, right below the mortar at its power core, or directly aimed at the cockpit. The Scorpion must be hit in the driver's canopy to kill him or her instantly, though to destroy the tank you must aim for the exhaust vent. It is powerful enough to make its way through nine Warthogs parked bumper to bumper. It is also highly effective at destroying Scarabs' leg joints, although The Covenant is the only mission where this can be done, and it is unlikely the player will keep the Spartan Laser that long into the level without completely draining its battery. The intense energy of the beam imparts splash damage up to a range of approximately two meters from the impact point. A careless operator that discharges the laser while too close to any obstacle will instantly be killed. The beam can also penetrate multiple obstacles and/or targets, provided they are aligned along a linear trajectory. It is powered by a BA-53635/PLMD non-replaceable battery, which is recharged with a PP-16979/AM-Sh charger. UNSC logistics, however, are not sufficient for the charger to accompany many M6 G/GNR units in the field. The version of the M6 G/GNR mounted on the AV-22 Sparrowhawk fires a bluish-white beam. The color of the beam suggests that it is fired at a higher intensity than the man-portable version, which is likely, as the mounted version has greater firepower due to the connection to the Sparrowhawk's main power supply. "It's not overpowered. It's an elegant weapon from a more civilized age." 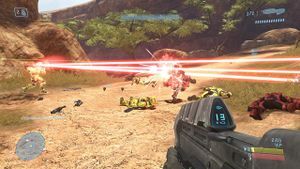 A player using the Spartan Laser to kill two opponents at once. The Spartan Laser, commonly known in player lexicon as the Splaser, is the most powerful small arm in Halo 3, Halo 3: ODST, and Halo: Reach, combining long range with lethal force. Most destructible vehicles are often destroyed in a single blast, except in the case of a near miss, in which case the target will still suffer heavy damage. It can also easily strike and kill multiple opponents and vehicles if they are lined up correctly. In Halo 4, its destructive capabilites are only matched by the Incineration Cannon, which is far less accurate than the Laser. As with all powerful weapons, there are a few disadvantages. The Spartan Laser needs to charge for three seconds (four seconds after Title Update 2), before firing, and requires another two to four seconds to cool down after firing. In Halo 3 and Halo 3: ODST the laser uses 20% of its battery's charge per shot, allowing for at most five shots. In Halo: Reach and Halo 4, the weapon uses 25% of its battery power per shot, allowing a maximum of four shots. The targeting laser may give away the operator's position. If a player sees the targeting beam, they could possibly dodge the shot, thus wasting valuable battery power. This is very unlikely, as the targeting beam is very faint and hard to see in the midst of battle and at long distances. However, it is possible to hear a charging laser if you are near the operator, and can thus enact a countermeasure to prevent the operator from striking. A point blank shot can cause fatal splash damage to the wielder, and close-range combat with the weapon puts them at risk of being injured or killed by debris. The laser's cycle time is dangerously long; while venting, the user is vulnerable to counter attack. Finally, the laser is infamous for the difficulty in aiming the weapon, being nearly impossible for inexperienced players to engage quick, erratically-moving targets (such as infantry units). This is caused by the charging time, which mandates that the player keep an accurate lock on his or her opponent, lest the laser discharge in vain. Should the target duck behind cover or out of line of sight and the operator cancel the firing sequence, it starts from the beginning. The weapon is not available in the Halo 3 campaign until the level The Covenant, in which John-117 begins the level armed with the Spartan Laser. There is another Spartan Laser lying nearby on the ground near the Pelican, presumably dropped by a Marine when it was shot down. The M6 is the only weapon able to harm 343 Guilty Spark on the final level of Halo 3, with the exception of the Fuel Rod Gun and Rocket Launcher, through a glitch. In Halo 3 Multiplayer, killing another player with the Spartan Laser awards the Laser Kill Medal. The achievement "Two for One" is unlocked by scoring a double kill with a single laser shot in any ranked free-for-all playlist. In Halo 3: ODST, the weapon appears in the levels Uplift Reserve, Kizingo Boulevard, ONI Alpha Site, NMPD HQ, and Coastal Highway, usually in hands of Dutch, as well as in all Firefight maps. The weapon charges slightly faster than in Halo 3. In the campaign, Jerome-092 and two of the members of Team Omega are armed with Spartan Lasers. In skirmish and multiplayer, the Spartan Laser is the final upgrade available to SPARTANs. The Sparrowhawk is equipped with a chin-mounted Spartan Laser. In campaign, multiplayer, or Firefight, getting 5, 10, and 15 kills with the Spartan Laser without dying will award (respectively) the "Laser Spree", "Red Menace", and "Sunburst" medals to the player. Like in Halo 3, killing an enemy with the weapon will give the player a Laser Kill Medal and one point towards the "Heavy Weapons" Commendation (or the equivalent, depending on the game mode). The spree medals are not present in Halo 4 multiplayer, though the "Laser Kill" medal remains, and gaining a kill with the weapon will award a single point towards the "Spartan Laser" commendation. The Spartan Laser is available for purchase in the pre-mission menu (for 75cR or 1,500 XP in Spartan Assault; for 750cR in Spartan Strike]]. The weapon is described in-game as dealing "Very High" damage per shot, whilst having a "Low" rate of fire. This version of the weapon features a battery charged to 400%, amounting to 16 shots as each shots consumes 25%. The Spartan Laser's beam lasts several seconds, quite long compared to other games. The weapon will fire this continuous beam only if the player continues to hold down the trigger; if the player releases the trigger, the beam will terminate. The battery will deplete 25% regardless of whether or not the beam lasts its maximum duration. The Spartan Laser also appears in a single campaign level in Spartan Strike. In mission E-6: Hold the Line, the player is tasked with defending an LZ against waves of Covenant attackers. Littered around the LZ are numerous Spartan Lasers, Rocket Launchers, and Sniper Rifles, as well as the Overshield, Seeker Drone, and Airstrike armor abilities, all of which can normally only be used after being purchased. Cannot pierce enemy units, including unshielded enemies. The UNSC Super Unit Condor is equipped with twin dual M8C Grindell/Galilean Nonlinear Cannons in addition to a Mini-MAC. Jerome-092 can equip the Spartan Laser on Skirmish on Spartan Upgrade level Two. In the campaign, Jerome-092 is equipped with an M8C Spartan Laser by default. The Spartan Laser has a slightly altered form factor, a darker color scheme, a different charging animation, and a thermal display attached to the side, which folds out when the weapon is unholstered or picked up. The Spartan Laser has a longer forward grip, with less space between it and the trigger than in Halo 3, making it appear that there is not enough space for the forward grip to fold up when not in use. When the weapon is charged, instead of one arrow moving down on the side of the reticule, two arrows move toward each other, meeting at the side of the reticule. The charging time is now 2.5 seconds exactly. The scope no longer zooms out instantly after each shot. The beam can now be moved in a sweeping motion (albeit for a brief time), inflicting (reduced) damage to multiple targets. The battery consumption for each shot is now increased to 25%, limiting the weapon to four shots. The weapon has been given new sound effects. The weapon now lacks the rear metal bar that is present on the Halo: Reach version. The red glare while charging is considerably reduced. It has been given a new paint job of a white finish. Beam deals variable damage depending on where it hits. Damage no longer applied all at once; beam deals less damage if not all of it hits. General decrease in overall damage, potentially requiring more than one shot for even light-armored vehicles such as the Mongoose, Warthog, or Banshee - though the weapon has since been buffed. Firing sound now reminiscent of the M6/E from Halo 5: Guardians. Base damage decreased, though damage increases proportionally to unit veterancy. The Spartan Laser is now exclusive to Jerome-092, under Captain Cutter as leader on Campaign and Skirmish. As a reference to its development program, the side of the weapon has the Norse symbol for Gungnir etched into it, which was the mythical spear wielded by the god Odin in Norse Mythology. Gungnir was described as having the ability to always hit its mark. Part of the mythology is that Odin would hurl his spear over the doomed side of a battle. The word "Galilean" is also printed on the side of the weapon. The Spartan Laser's beam seems to trail off forever when fired into the sky, very much like the Sentinel beam. The beam of both weapons does end, however, usually at the invisible walls of the playing area. The laser beam on Sandtrap covers over 75% of the width of the area when fired at a 45-degree angle. It remains unclear what kind of mechanism the M6 uses to create its laser beam. Some have suggested that it uses a chemical laser; however, a gas or chemical laser does not produce a powerful energy output, and also require large amounts of highly volatile and toxic chemicals to function, which are expended as the weapon fires. The weapon seems to be only powered by a rechargeable battery pack, hinting that it may be a Solid-State Laser or Free Electron Laser, which does not require a constant source of a chemical gain medium. Luke Smith's comment: "It's not overpowered, it's an elegant weapon from a more civilized age," is a reference to Star Wars' lightsabers, described as such by Obi-Wan Kenobi. In The Package, the Spartan Laser is shown to be able to deflect an energy sword and is, in that instance, dual wielded with an M7 SMG. In The Package, after Frederic-104 fires his Spartan Laser twice, his HUD shows its battery has 80% of its power left, meaning his Spartan Laser has only expended 10% of its power with each shot. However, in Halo 3, Halo 3: ODST, and Halo: Reach as well as Halo 4 and Halo 5: Guardians, the Spartan Laser uses 20% and 25% of its battery with each shot respectively. It is possible the Spartan Laser can change the amount of battery charge used in its shots, as the shots fired by Frederic seem dramatically weaker than those fired in the games. When the player picks up a Spartan Laser that has a battery percentage that does not divide by 20 evenly, they will be able to fire a 20% powered laser and another shot after that with the remaining charge. As with all battery weapons, a weapon with low power that is dropped on the ground when its AI operator is killed will be assigned a random power level between 60% and 70%, unless you have the famine skull on. Oddly, the Spartan Laser's barrel cover can be seen opening up when the player switches to it, even though it is already open on the player's back. Early concept art of the Halo: Reach starfighter YSS-1000 Sabre includes the Spartan Laser, which was most likely replaced by the Medusa missiles. Unlike other weapons, an emptied M6 G/GNR will never appear on the ground when dropped. The Halo 4 model of the Spartan Laser has an electric shock warning of 1.21 gigawatts, in reference to the DeLorean time machine from the Back to the Future series. The laser aperture warning decals say, "Big Scary Laser: Do not look into beam with remaining eye." The Selene's Lance variant of the Spartan Laser could possibly be named after the Greek Goddess of the same name. Concept art of the M6 Spartan Laser for Halo 3. A profile view of the M6 Spartan Laser in Halo 3. The M6 Spartan Laser in Halo 3. A first-person view of the M6 Spartan Laser. A blueprint of the Galilean. HUD of the Spartan Laser in Halo 3. The 2× zoom of the Spartan Laser. A 2D Spartan Laser uncovered through modding. The end of the laser beam across Sandtrap. Mark IV-clad Spartan-IIs with Spartan Lasers in Halo Wars. A Sparrowhawk fires its nose-mounted Spartan Laser. Note the blueish beam, instead of the normal red laser. Frederic-104 firing a Spartan Laser in The Package. Concept art of the M6 G/GNR for Halo: Reach. A first-person view of the Spartan Laser's targeting reticule firing at short-range in the Halo: Reach Beta. A Mark V(B)-clad Spartan-III wielding a Spartan Laser in the Halo: Reach Beta. In-game side profile of the M6 Spartan Laser in Halo: Reach. The M6 G/GNR in Halo: Reach. A profile view of the Spartan Laser in Halo: Reach. A look of the Spartan Laser on the user's back in Halo: Reach. Concept art of the M6 Spartan Laser in Halo 4. In-game left side view of the M6 Spartan Laser in Halo 4. An M6 G/GNR with the protective cowling still deployed. First-person view of the M6 Spartan Laser by John-117 in the Halo 4 campaign. First-person view of the M6 Spartan Laser in Halo 4's multiplayer. A view through the M6 Spartan Laser's scope. HUD icon of the Spartan Laser in Halo 4. Render of the Spartan laser scope in Halo 4. A warning sticker placed on the right side of the Spartan Laser. A 'high voltage' warning sticker placed on the back of the Spartan Laser. Spartan Sarah Palmer using the M6 G/GNR against a Type-26 Wraith in Halo: Spartan Assault. A Spartan-IV holding a Spartan laser in Halo: Spartan Strike. An M6 Spartan Laser in Halo: Spartan Strike. The M6/E Spartan Laser in Halo 5: Guardians. First-person view of the M6/E Spartan Laser by Edward Buck in the Halo 5: Guardians campaign. First-person view of the M6/E Spartan Laser in Halo 5: Guardians. Smart scope with the M6/E Spartan Laser. Third-person view of the M6/E Spartan Laser engaged in smart scope. The M6/E Spartan Laser overheating in Edward Buck's hands. A Centurion-clad Spartan-IV with an overheated M6/E Spartan Laser. An Athlon-clad Spartan-IV holding an M6/E Spartan Laser. A Warrior-clad Spartan IV wielding the M6/E Spartan Laser. The Spartan Laser's laser in Halo 5: Guardians. First-person view of Selene's Lance in Halo 5: Guardians. A Spartan wielding Selene's Lance. A Spartan Laser in Halo Online. Spartan Laser model in Halo Wars 2 gameplay.